Each part of the wheel is critical for a vibrant Christian life. Christ is the center. 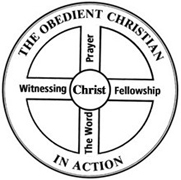 The rim is the attitude of obedience towards Christ’s commands. One’s relationship with God is the vertical spokes. Fellowship with Christians and the task of witnessing to the people of this world are the horizontal spokes. A healthy wheel can only be had when all of the spokes are in place. When the wheel hits some bumps in the road, then the wheel does not buckle and become distorted. It continues to ride straight and true. It withstands potholes. But when the spokes are broken, or non existent, then the wheel become twisted and bent and can not function properly as a wheel. My life as a disciple, for many years, was like wheel missing a few spokes. For many years I planted in the Lord’s harvest field (12 years) by means of a campus house church. We were a single family house church. I was very active as a disciple of Jesus. But when I look at the “Wheel” I can see that though I excelled in several areas, I was very deficient in others. I was trying to be obedient to the Lord. I had lots of deep Bible study. I was involved in witnessing to others. But I lacked in prayer and fellowship and in my relationship with Jesus. I was so busy working, raising my family, teaching the Bible and managing the house church ministry that my prayer life was very shallow. I was more concerned about producing a ministry with “numbers” and other features that could be recognized by others, that I ignored my relationship with Jesus and ended up exploiting others to build up the ministry. I pushed others close to me to produce things like music, the church bulletin, to the mechanics of a Sunday Worship service. I didn’t care if what we were doing was promoting the worship of God. All I wanted was a complete Sunday Worship Service, hopefully with new attendants. I took great pride that my family could reproduce a quality worship service all by ourselves, week after week. But I did not care about their relationship with the Lord. Bible study was mechanical and routine. I had fellowship with churches 70 miles away but not locally. Going to frequent meetings is one thing, but having a relationship with local believers is another. There were weekly meetings and church conferences, but no local fellowship with local believers. If I wanted Christian fellowship it would involve 6-8 hours and 120 miles of driving and $30 for food, tolls and gas. Every fellowship event involved some teaching and a formal meeting. My only day to day fellowship was with my family and a few Bible students. I was missing seeing fellow church members at the supermarket or in a coffee shop. I was missing times of simply visiting the pastor or other men of the church to talk (with only a short commute). I was missing being engaged in a mission with other people in the community, where not everyone was my Bible student, and being part of the community. And so I suffered a lot without concentrating on the spokes of Christ, fellowship and prayer in the Wheel. It ended in depression, anger, unreal expectations, and isolation and ultimately fruitlessness and an inability to advertise Christ and the Gospel of God’s grace to others. God saved me from such a life however. Through a long series of painful events, that unfolded over the years, my need for some modifications to my life as a disciple of Jesus was revealed. I realize that now I want to focus on all parts of the “Wheel” without neglecting even one spoke. More information can be found at www.navigators.org under “Tools”. « Proud of my kids involvement in music. Mark’s concert and the A’capella concert coming up !